While it is recommended that most gym floors are made from durable rubber, there are countless areas throughout your gym that need the best in non-slip grip and impermeable design. After all, assuring the health of your occupants should be your primary role as a gym owner. Here’s where you should use a quality polyaspartic commercial floor coatings in your athletic facility. The floor around your pool is perhaps the most dangerous location in your gym. After all, people of all ages and abilities will jump at the opportunity to use a good pool in their neighborhood. Unfortunately, it’s rare for gym pools to install safety fences around an indoor pool. As such, it’s up to your gym to ensure a single slip and fall never happens. Without the proper floor coatings, this might cost you and your company dearly down the line. Any good concrete floor coating company knows that the value of a non-slip floor around a gym’s pool. Along with providing a more secure grip, these impermeable coatings will also help maintain the longevity and quality of your building. Install the proper signage, have lifeguards on duty, and utilize a great floor coating to prevent slips and falls in wet areas. Saunas are becoming increasingly popular in gyms across the country. These humid areas are prone to slick tile floors, but a commercial floor coating can stop any slips and falls both in and out of your sauna. Easy-to-clean concrete floor coatings will also ensure disinfecting these areas multiple times a day is a breeze. You never need to worry about bacteria building up in impossible corners and beneath your floor. Another particularly dirty area in the gym is your locker room. These areas need to be cleaned often since they’re prone to bacteria buildup after a heavy workout from multiple people. Investing in great commercial floor coatings will ascertain that cleaning and maintaining this environment is easier than ever. Whether you’re dealing with winter snow or the occasional summer shower, you should always rely on concrete floor coatings at the entrances and exits of your gym. You never know when inclement weather could cause a terrible slip and fall. Luckily, polyaspartic commercial floor coatings can be installed much more quickly than epoxy coatings. Epoxy can take up to eight hours to cure, potentially impacting your gym’s hours and function. Rely on the experts at Collins Concrete Coating to make your gym a safer, cleaner space for your customers. 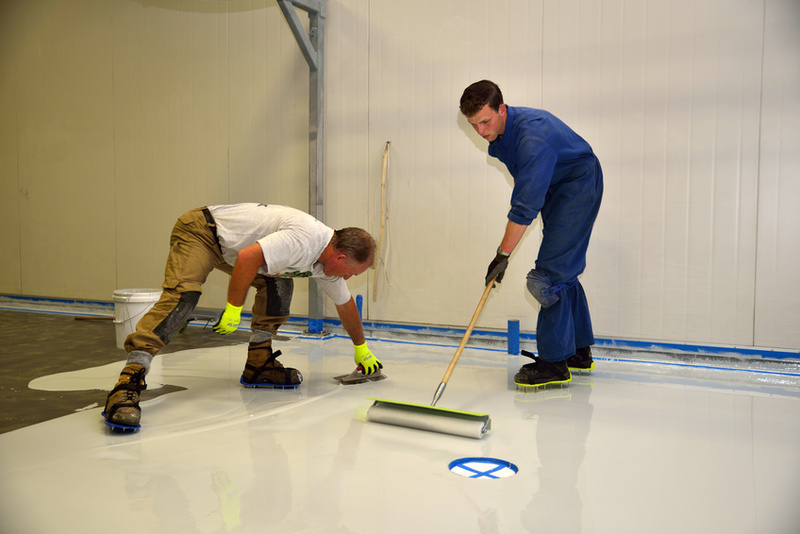 What Is Polyaspartic And How Does It Compare To Epoxy?